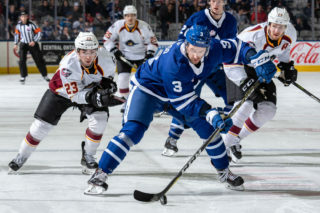 The Toronto Marlies closed out a four-game road trip on Wednesday night with an overtime win in Bridgeport. 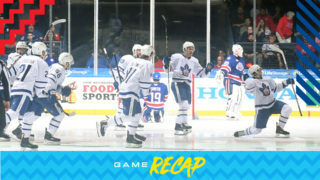 Adam Brooks provided the overtime heroics as the Marlies evened up their season series against the Sound Tigers. It was a tight defensive battle all game long as each team battled to establish a lead. The Sound Tigers opened the scoring early in the second period with a goal from Sebastian Aho. 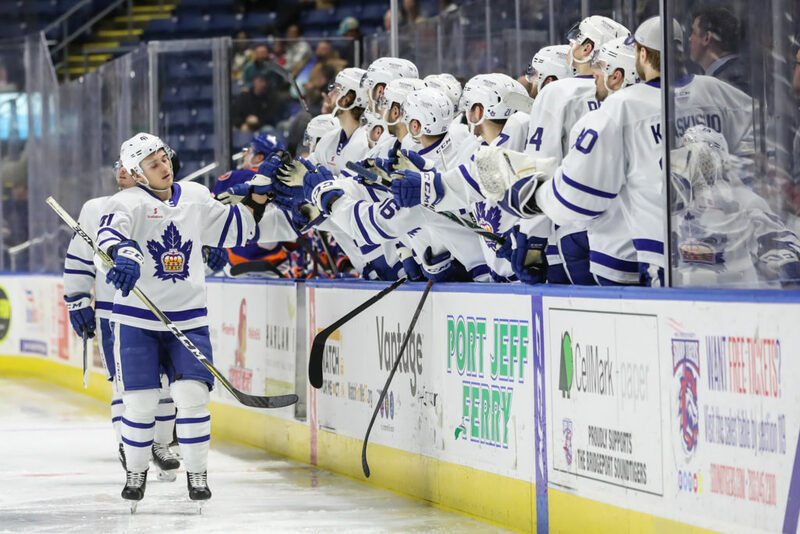 The Sound Tigers maintained their lead for the remainder of the middle stanza and the Marlies found themselves down by one heading into the final frame. An early power play gave the Marlies an opportunity to even things up, and they did just that, converting on a 5-on-3 at 2:38 of the third period. Jeremy Bracco fed Dmytro Timashov a cross-crease pass and he made no mistake burying it to get the Marlies on the board. 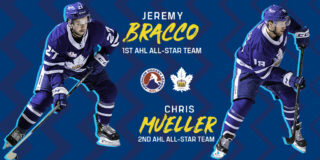 Adam Brooks picked up the secondary assist on Timashov’s goal, while Jeremy Bracco’s primary assist set a new single-season franchise record of 30 power play assists. The score remained even at 1-1 at the end of regulation, sending things to 3-on-3 sudden death overtime. Adam Books potted the game winner at 2:38 of the extra frame as Bridgeport net minder Jeremy Smith missed a poke-check, leaving Brooks with a wide open cage. Chris Mueller and Rasmus Sandin had the assists on the game winning goal. 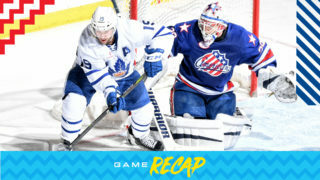 The Marlies will return home this weekend for back-t0-back games again the Rochester Americans at Coca-Cola Coliseum. Dmytro Timashov scored on the power play at 2:00 of the third period. Timashov has 44 points (12 goals, 32 assists) in 63 games this season. Adam Brooks scored at 2:38 of overtime and earlier added the secondary assist on Timashov’s third period goal. This is his second overtime goal of the season and his fourth game-winning goal. Brooks has seven points (4 goals, 3 assists) in his last five games. Jeremy Bracco registered the primary assist on Timashov’s third period power play goal. Bracco’s assist set the new single-season franchise record for power play assists (30). He has also tied the franchise record of 52 for assists (Spencer Abbott – 2013-14). Bracco has recorded a point (2-9-11) in six consecutive games. Chris Mueller recorded the primary assist on Brooks’ overtime goal. Mueller has recorded points (9-8-17) in 10 consecutive games. Mueller has 58 points (28 goals, 30 assists) in 51 games this season. Rasmus Sandin picked up the secondary assist on Brooks’ overtime goal. This is Sandin’s eighth consecutive game recording a point (1-11-12), establishing a franchise record for consecutive games (8) registering a point by a defenceman. Michael Hutchinson stopped 30 of 31 shots he faced. Hutchinson’s record with the Marlies is now 13-3-3-0 on the season with a .914 Save Percentage and a 2.76 Goals Against Average. This is Toronto’s 18th overtime game of the season, setting a franchise high as well as their 12th overtime win of which seven have come on the road. Toronto is 20-8-3-2 since January 4 and have outscored their opponents 107-91, facing 17 different teams. In 25 of 33 games, Toronto has earned a point (45). Toronto went 5-for-5 on the penalty kill and 1-for-2 on the power play. Toronto’s power play on the road is first overall (26.8%) in the AHL with the most power play goals-for (42) and has scored seven goals on their four-game road trip. During the same time, Toronto’s penalty kill has allowed only one goal (14/15). Bridgeport had a 31-27 edge in shots in all situations. Tanner MacMaster led the Marlies with four shots on goal. The Marlies are 10-6-0-1 against Atlantic Division opponents and are 1-0-0-1 against the Sound Tigers. The Marlies are 10-6-3-1 when tied after the first period and 3-16-2-1 when trailing after the second period. Toronto is 16-11-2-2 when outshot by their opponent. The Marlies are 6-4-0-1 in Wednesday games and are 6-2-0-1 in March. Jeremy Bracco has points (2-7-9) in five consecutive games. Adam Brooks has points (2-2-4) in consecutive games. Chris Mueller has points (9-8-17) in 10 consecutive games. Rasmus Sandin has points (1-11-12) in eight consecutive games. After (Bridgeport) scored their goal early in the period, I thought that’s when we started to play. I didn’t mind our second period from that point going forward. I didn’t mind our game from that point forward. We had a really great third period. Some penalties in the second period kind of took the wind out of our sails a little bit but our penalty kill was really good today. We did the things we needed to do to hang around the game long enough to find our legs and get playing. We know that we need to get better at five-on-five but special teams have been outstanding for us and that’s been our recipe is to hang around in game and we haven’t scored a whole lot at five-on-five but we haven’t given up a great deal either so that’s keeping us in games and then special teams have been the edge. Special teams have been executing. (Assistant coaches) Rob (Davison) and A.J. (MacLean) on the penalty kill and power play have done an outstanding job for us and Jon Elkin with goaltending has found some consistency there for us. Everybody’s doing well, giving us time here to get healthy and finding ways to get points while doing that. I thought he has a lot of really great shifts with second efforts. I thought one of the benefits of killing penalties was that Brooksy’s out there, he’s competing. I thought that really got him into the game and he started to feel it a little bit and not just the battles in the corners but he had some great scoring chances. Great to see him be able to finish it off. The Toronto Marlies close out their four-game road trip tonight in Bridgeport for their last meeting of the season against the Sound Tigers. 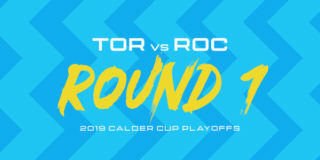 The Marlies will be looking to even up the season series against the Sound Tigers after dropping a 3-2 shootout decision on home ice back on March 2. 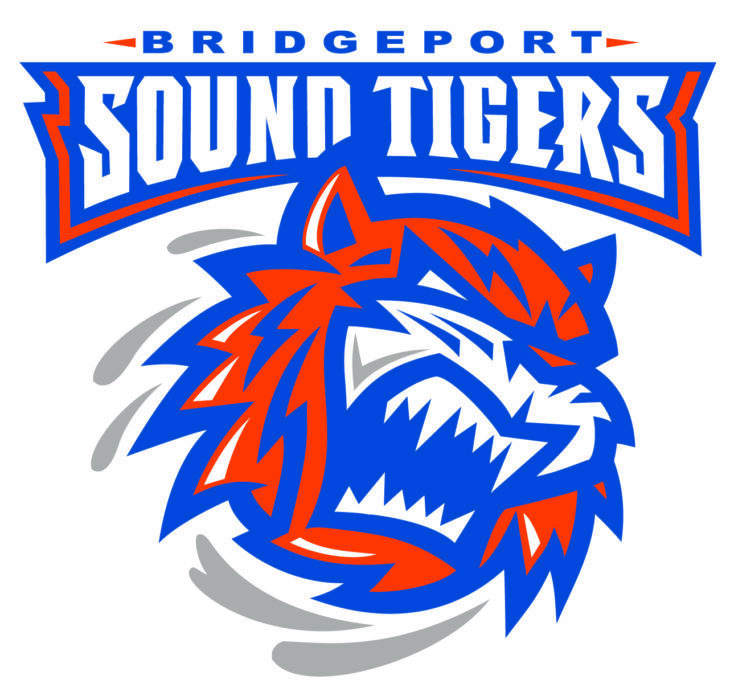 They’ll have their work cut out for them as the Sound Tigers boast a 21-5-2-1 record at home and have won eight of their past 10. They currently sit second in the Atlantic Division and fourth in the Eastern Conference. 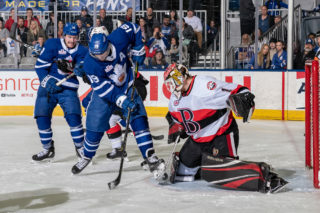 With two wins over the weekend, the Marlies have now won six of their last 10 and have a firm hold on third place in the North Division with 78 points, six points ahead of the fourth place Belleville Senators and five points behind the second place Rochester Americans. Special teams situations will be key for the Marlies, who currently have the best road power play in the league (26.5%). They’ve seen success on the power play in seven straight games heading into tonight and their penalty kill has been perfect in seven of their last eight games. Player to watch: Chris Mueller is currently riding a nine-game point streak, totaling 16 points (nine goals, seven assists). He has registered two points in seven consecutive games and his nine goals through eight consecutive games is the league’s longest goal streak this season. With his second power play assist on Sunday, Jeremy Bracco tied Tim Stapleton for the franchise record in PPA with 29. He has recorded 69 points (18 goals, 51 assists) through 64 games so far this season and continues to lead the AHL in assists.